I’m convinced that the ferry to Hvar is magic! Even when it’s tipping down with rain on the mainland, drenching cold and horrible, yet within the short sail to the island, the clouds clear and the sun comes out! On our very first visit, we spent the few days before on the neighbouring island of Brač (pronounced Bratch). The morning we left, the fog was so thick we could scarcely see to the front of the car, never mind the road. Of course, Brač is pretty much a 3,500 foot high marble plateau so any passing cloud does tend to get snagged. So, there we were, crawling along the road, a wary eye on the clock, trying to make it to the ferry terminal before the boat sailed. 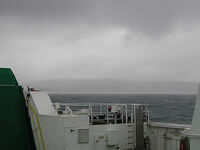 Down at sea level, it was wet, grey and chill. Worried about the time, we drove straight on to the ferry. Which turned out not to be the way it works – we should have stopped on the quay to buy our tickets first! As they explained this to us, other cars with confused drivers packed on behind us, so we all had to walk back over to the ticket office in the rain. Our route to Hvar on this occasion took us from Sumartin on the eastern end of Brač, over to Makarska on the mainland, followed by a drive down the coast to Drvenik, and the short ferry hop over to Sućuraj on Hvar. Incidently, Sumartin translates as St Martin, while Sućuraj is St George. Somewhere on the Drvenik-Sućuraj crossing, the sun came out, and the sea turned a sparkly blue green. 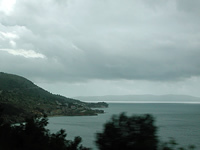 Over to our right, Brač was still under its menacing cloud cover, but the cold and damp was forgotten as we headed off along the road of this lovely sunny and remarkably green island. Just gorgeous! Hvar certainly lives up to its reputation as the sunniest island in the Adriatic, and never really gets very cold. This was in April, so the weather can be somewhat changeable at this time of year. 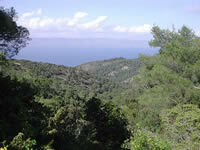 I think that all the surrounding land is a little higher, so the worst of the weather is used up before getting to Hvar. Anyway, it seems that way. For us, the magic ferry has been very dependable at all different times of year, and works for any of the sailing routes. When you take the ferry to Hvar – the world turns sunny. I love it!